Synopsis: Neopolis is a city like no other on Earth. It was built to accommodate the legions of science-heroes (and their counter-part villains) born out of the World War II conflict. The city is home to science-heroes, super-villains, talking animals, vampires, mutants, robots, and even demi-gods. Imagine a city where everyone has powers and the uncanny becomes the mundane. The greatest problem facing Neopolis is how to keep order among a populace of science-heroes. Crimes still occur, but the degree of complexity increases exponentially in a city of super-beings. 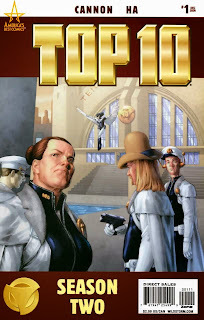 The Neopolis Police Department was created to keep order and is backed by a multiversal peace-keeping organization as their 10th Precinct - Top 10 for short. The officers of Top 10 are tough and have seen it all. They include Kemlo 'Hyperdog' Caesar, Irma 'Irmageddon' Wornow, Jackie 'Jack Phantom' Kowalski, Duane 'Dust Devil' Bodine, John 'King Peacock' Corbeau, and Peter 'Shock-Headed Peter' Cheney among others. Two officers are on leave - Jeff Smax and Robyn 'Toybox' Slinger (who recently finished her first year with the department). 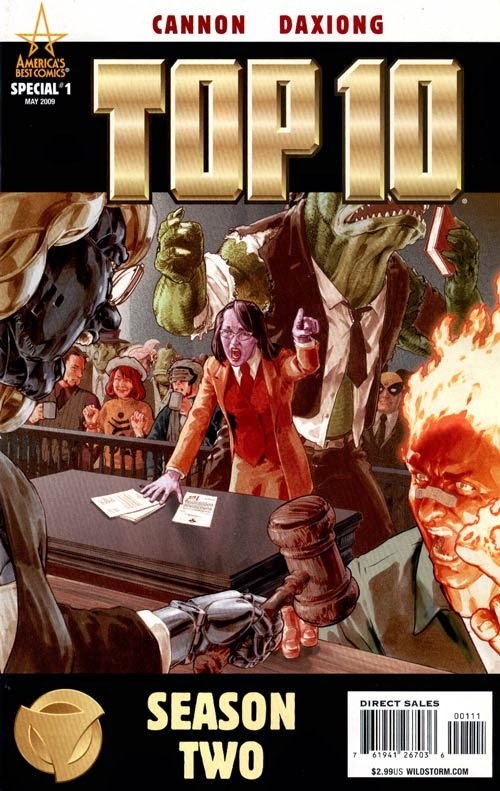 Top 10 recently dealt with a major crisis within the multiversal peace-keeping force which resulted in a new commissioner being selected, David Moon Gilbert. He's somewhat of a tyrant who demands order among the troops and institutes severe adherence to protocol. He installs robotic sentry receiver units in each precinct house to monitor and frequently micro-manage staff. Officers are ordered to wear traditional uniforms instead of individual attire and non-standard ordnance is banned. No surprise the new rules are very unpopular. Gilbert transfers one of his best officers to Top 10 named Slipstream Phoenix. He's met with suspicion and rudeness due to being seen as a spy and lapdog (he wears the standard uniform and sticks to the rules). Also joining the force is Girl Two who looks exactly the same as Girl One, but doesn't share her same memories or personality. Irma was the former's partner and is unhinged by the appearance of a replacement. A whole new crop of problems are faced by the officers of Top 10 both from within and without. One dozen strangled girls materialize out of nowhere in front of the precinct with no leads. Who could be the murderer and how did he kill all of the girls within a few minutes of each other? There's trouble at home for Lieutenant Cathy 'Peregrine' Colby when she catches her husband crossover-dressing. Someone is giving kids magic words which transform them into powerful beings who are running amok. It's up to Duane and Peter to solve the case, but Peter has been falling further into a self-destructive spiral. He's becoming dangerously unstable and unpredictable. What will this next year hold for the officers of Top 10? Mike Tells It Straight: Zander Cannon did layouts for the first Top 10 series (Vol. 1 Vol. 2) and penciled the spinoff Smax book. He's been with the series since the beginning and knows the characters. Top 10 was a multi-Eisner award winner for both the first series and prequel graphic novel, Top 10: The Forty-Niners. 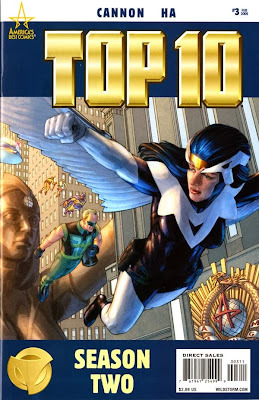 Both were critically acclaimed and some of my favorite books of the past decade, but disappeared after Alan Moore cut his ties with DC Comics once again (he was backdoored into working with DC Comics after they acquired Jim Lee's Wildstorm group who Moore had originally agreed to have publish his ABC line). A disastrous mini-series called Top 10: Beyond the Farthest Precinct was released in 2005 and I thought that was it for the series. It was that bad. When Season Two was announced without Moore involved I was expecting another flop to put the nail in the coffin, but was pleasantly surprised to discover Zander and Kevin Cannon (no relation) nailed the feel of the first book. Alan Moore has big shoes to fill and the pair do an admirable job. The book fits almost seamlessly into continuity by occurring at the same time as Smax (both Toybox and Smax are on leave in this one) while Beyond the Farthest Precinct is set five years into the future. The Cannons have multiple sub-plots going at once which was a big feature of the first series. The best part of Season Two is the return of Gene Ha! His artistic vision and excessive attention to detail were an equal contributor to Moore's writing in the first series. He's amazing and the awesome popular culture fictional character cameos return (a few X-Men from the Age of Apocalypse appear and many more). The art's a real treat...after the first issue. The character coloring is excessive in the first issue as Sinclair's colors quite noticeably overpower Ha's artwork. I think it's an attempt to meld the amazing coloring technique used by Art Lyon from The Forty-Niners (which won an Eisner Award) by Alex Sinclair. It doesn't work and the creative team seems to realize it. The colors settle down after the first issue. I was really disappointed with this series because it doesn't really end. It was originally planned for eight issues and two specials, but gets cut in half by DC Comics due to projected low sales. The Cannons and Ha really start to get going and are then forced to end the series before even one quarter of the sub-plots are resolved. It's a real shame and could have been another great series. 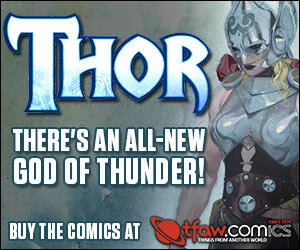 I bet trade paperback/collected edition sales would have made the book profitable over it's lifetime. Seems shortsighted to me and I lament what could have been. From interviews I think Cannon has enough material for another Top 10 series and Ha wouldn't mind working on it again. 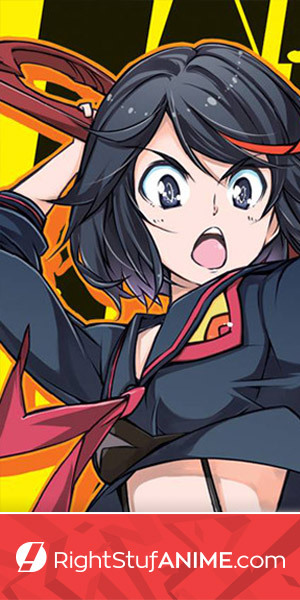 Maybe someday, but Season Two is the last work from the franchise as it stands.